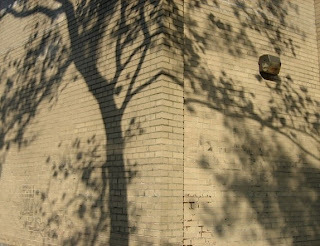 I've always liked this large wall on the side of a building about a block from my apartment. It looks like someone tried to clean it with bleach, but didn't do a very thorough job - and it makes a great canvas for shadows. It's definitely that time of year again. Times Square is filling up with wandering tourists. Each night when I leave work I wind up walking behind phalanxes of baby strollers in order to reach the subway. It wasn't too many years ago that Times Square, particularly 42nd Street, was kind of a dicey area - and now people take armies of toddlers there. Anyway, preparations are being made for the big New Year's celebration, with utility trucks and crowd control barriers in evidence. My response is to get out of town. 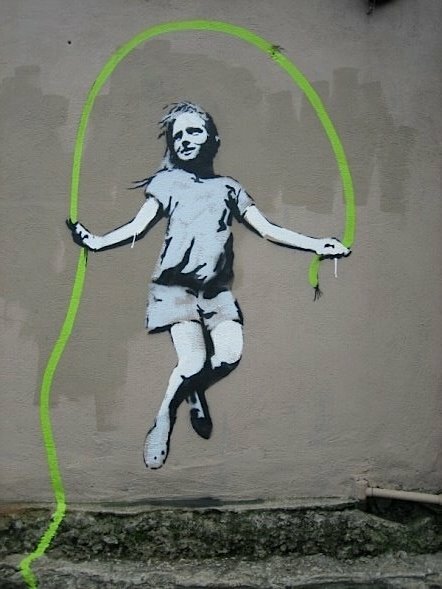 I will be away from my blog until Tuesday. So happy New Year, and I'll see you in 2007! 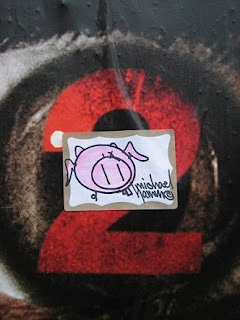 This curious sticker was slapped over a poster advertising a bad horror movie. If I'm not mistaken, that pig has wings. I guess the artist is having some fun with his own last name, Hamm? I'm getting questions about the status of my recent speed dating adventure - so here's an update. One of the three guys I met that night, Nathan, never called me back, thus violating a sacred rule of the speed dating ritual...but whatever. The other two, Robert and Dave, I've seen - Robert once and Dave twice. I think I'll see them again. But while they're nice guys, they might not take kindly to being blog subjects, so for now, that's all you're going to get out of me! 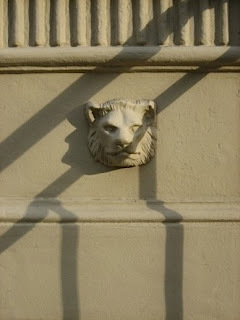 This lion keeps watch from a wall on Mercer Street, near the Angelika cinema. The Angelika is a very popular movie theater on Houston Street for indie and foreign films. It's always crowded, which unfortunately means you've got to line up like cattle in the chaotic lobby cafe. 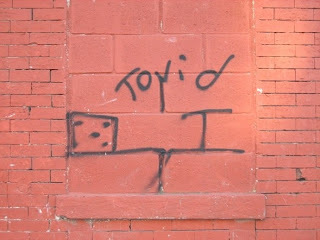 A rather peculiar bit of graffiti from Tovid, on or near W. 52nd Street. More Tovid here. I'm back in New York this morning, having dragged myself out of bed at 3:45 a.m. to catch an early flight from Tampa. And now I have to go to work! I hope no one relies on me for anything important today! This is from the front of a small church on 126th Street. 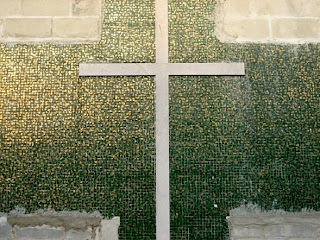 I couldn't tell whether the church is still functioning, but I liked the little green and gold tiles. We didn't make it to church this year. I grew up a Presbyterian, and normally my family goes to a midnight service on Christmas Eve. But this year, with the baby along, it seemed a little too complicated. So instead we went out driving last night to look at Christmas lights, and the baby slept the whole time. Looking at Christmas lights is kind of funny. Our culture definitely rewards "maximalism," if there is such a word, with the most riotous displays getting the attention and awards. Of course, I tend to go for the minimalist ones: We saw one house with three palm trees in the front yard, their trunks circled with little white lights. That's my idea of a nice Christmas display: very simple. It might seem odd that a Buddhist would want to go to church on Christmas. But I do like the social traditions of the holidays, and as we've discussed at my Zen center, religions are really more similar than different. What Buddhists seek through our ideas of oneness and emptiness is really not all that different from what Christians seek in God. So for me, there's no conflict. 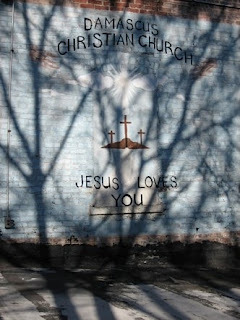 This is the back wall of a church in the Bronx, near the Grand Concourse. Seems appropriate for Christmas Eve! Life here in Florida, where I'm visiting the family home, could not be more different from my life in the city. I grew up in an area with lots of wilderness, grass and palmettos and even the occasional alligator and armadillo. Our house is on a lake surrounded by tall cypresses, there are cattle ranches and orange groves nearby. The darkness at night seems thick and dense. But this is all changing, as more and more people move to Florida. Last night, as we were walking, we passed a grove where a builder will soon put 10 houses. The large ranch behind our neighborhood is slated to turn into a big subdivision. And the darkness, though still dark, is not like it was when I was a kid, and could look up and see the wide pale band of the Milky Way crossing the night sky. Of course, change is inevitable everywhere, but it may be even more inevitable here, with hundreds of people moving to the Sunshine State every day. I try not to be too cynical about it, but I do worry - about the Great Horned Owl we saw last evening in the top of a tree, for example, hunting in that grove where those houses will soon go. The good news is, my family is fine and we're all getting along. My baby niece, Jane, who is only four months old, is entertaining us all with her big smiles and wide open blue eyes. This was at Second Avenue and E. 33rd Street, just north of my neighborhood movie theater, the Loewe's Kips Bay. I'm in Florida now, practicing patience with my Mom's dialup Internet connection. The last 24 hours have been an exercise in patience, in fact: Making my way to the airport, waiting there, and waiting, and waiting - my flight was delayed a bit - and then spending three hours in the air. I did a lot of sitting around yesterday. I got lots of reading done, though, so that's the upside. This is the sales office for Ian Schrager's new condominium project, 40 Bond. The interesting interior screen first caught my eye, but when I took the photo through the window I liked the way the reflection from the street added another visual layer. Tonight I will be winging my way to Florida for a few days. I plan to keep blogging from there, but I'll be staying at my Mom's house, and she has a dialup Internet connection - so I make no promises, except that I will try. Last night I had a rare New York opportunity - a visit to Gramercy Park. It's a gated, private park at the southern end of Lexington Avenue, accessible only to the people who live around it (who pay for the privelege). I had dinner with a guy (one of my "speed dates"!) who had a key, so we took a stroll through the manicured grounds, admiring the big Christmas tree and enjoying the stars. I almost never see stars in New York, but I could pick out Orion. It was a nice end to a pleasant evening! 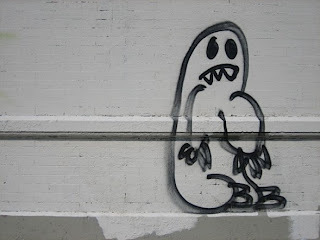 I found this unhappy Godzilla-like creature on Barrow Street near the West Side Highway. Maybe he's been displaced by gentrification. I was feeling kind of crabby at work yesterday (probably wearing an expression a lot like Godzilla here). My boss was about to leave town for the holidays, giving me a bit more work than usual. My coworker will soon be out of the office for a couple of weeks, which will make things really intense for me. And, as I said yesterday, my own week has been busy enough - I haven't even been able to get to the gym, which is my big stress reliever. (I'm going as soon as I finish writing this!) The result: crabbiness. I felt immediately sorry that I'd been grumpy. I got to thinking about giving, and the nature of gifts. I always feel like I really don't "need" anything, which I suppose is technically true; no one else on my list really "needs" anything either. Sometimes I've wanted to just dispense with the gifts altogether. But they DO make a difference - if nothing else, they're a way of showing people they matter, which is something we often forget to say. 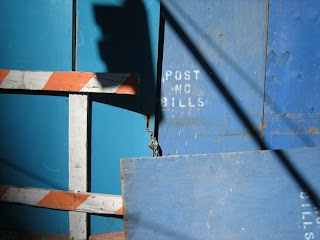 For some reason, whenever a plywood wall goes up around a construction site, it's painted bright blue. I'm sure this must be rooted in some city code, but it's interesting that we have such a custom. Why blue? This particular wall surrounds the new building for The New York Times, which has gone up at the corner of 40th Street and Eighth Avenue. The new Times building has generated a bit of buzz - I was reading a rant the other day from one blogger who hates it. I think he called it a "gray prison." That's a rather severe description, but I agree it's not quite as lightweight and luminous as it looked in the architectural renderings. Let's save our final judgment until it's done, though! This week is turning out to be a bear; I guess that's to be expected the week before Christmas. So much to do! As I was sitting last night, following my breath, watching my brain periodically float random thoughts, I found myself wishing that my meditation time would hurry up and end so I could move on to other things. It struck me how silly that was. I was basically wishing for a half-hour of my life to rush by! This was the scene at 11 Spring Street over the weekend. You may remember that I mentioned this building back in October; it's been a longtime mecca for street artists, but was recently sold and is now due to be converted into condos. 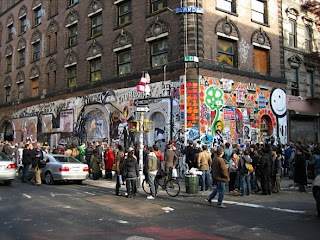 As a sort of farewell, the new owners, along with folks at the Wooster Collective, staged a massive street art exhibit there. 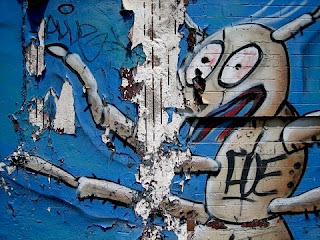 The interior walls of the building were used as giant canvases, with artists invited to paint them; they'll be covered up by drywall in the renovation, but not removed. 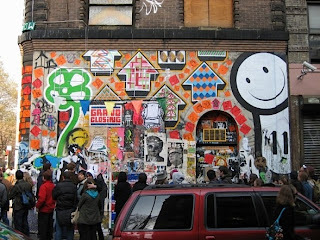 The exterior turned into an ever-evolving mishmash of art. One artist would paint something and it would stay up for a short while, and then be slathered over by someone else with new art. 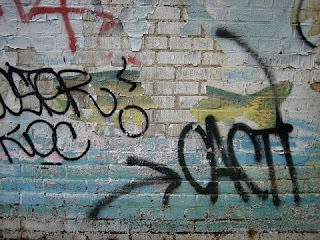 I think the art must be an inch thick on the walls! This is the same corner I shot in July (see earlier post, linked above). As you can tell, the dog is long buried under all that other stuff. 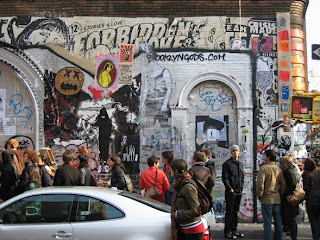 The art on the outside walls will be cleaned away with the condo conversion, by the way. 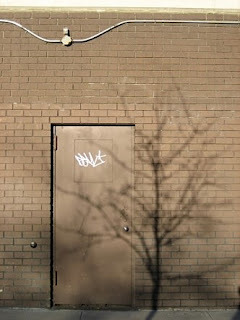 I found this interesting door when I went on the graffiti walk in Williamsburg in September. Like my "Find the Fish" photo on Friday, this has sort of a Monty Python connection - remember the killer rabbit from "The Holy Grail"? Last night I went to see "Bobby," Emilio Estevez's film about the hours before Robert Kennedy's assassination. It's terrific! Good acting, compelling storylines, and most of all moving. I teared up more than once, particularly during the newsreel footage, which was incredibly painful to watch. Estevez is obviously holding up a mirror to our own time. The movie is only superficially about the death of Kennedy; it's really about being caught in a scary time, and having hope, and then seeing that hope destroyed. I don't understand why the critics didn't fall all over themselves to praise "Bobby"; they got hung up on the number of characters and the fact that many of those characters are only briefly on the screen. But I felt like I connected with all of them in some way. 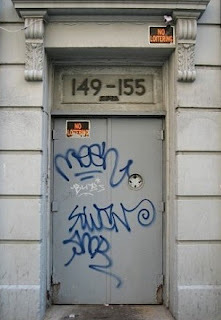 I liked the curves and spirals in the blue tags on this door, on W. 24th Street. I've never really understood "No Loitering" signs, though. Does that mean you can't just stand there, on the sidewalk? Seems a little strict, doesn't it? In the ongoing Google search watch: Two interesting searches led people here recently. One was "picture of a hairy chested man winking," which I assure you is NOT on my blog. The other was "my zen is uploading songs by itself." Hmmmmm. I have to think about that one. Have you ever seen the Monty Python movie "The Meaning of Life"? There's a very strange skit in the middle of the film, in which a man dressed as a butler with long rubbery arms and a sort of Frank N. Furter-style transvestite in a corset perform a long, elaborate poem called "Find the Fish." It's hilarious, though completely nonsensical. I call this photo "Find the Fish." I think I've more or less finished with my holiday preparations. In terms of decorating, I have one strand of colored lights which I get out every year and wrap around the burglar bars on my window. (Isn't that so New York?) They look nice at night and in the dark early mornings. And they keep burglars away! You've gotta love such a highly functional holiday decoration! I didn't send many cards this year. (You may remember my debate about this.) I sent a few cards to those who sent them to me, and I plan to send a big e-mail to everyone else explaining what I've been up to. That way I can keep in touch yet not waste all the paper. For gifts, I made donations to Oxfam. They have a program whereby you can "buy" a cow or sheep or other item for a poor family, and Oxfam sends a card to the folks on your gift list acknowledging the donation on their behalf. I also picked up some small items so I have something concrete to give, like a book for my stepmother and some finger puppets for my baby niece. Finally, I had some of my photos enlarged for my family members (who, incidentally, never read my blog - so I'm not giving anything away here). I might frame them before Christmas, or I might just give them without a frame. I got a little stressed yesterday trying to find the right frames, and worrying about how I was going to get a stack of framed 8x12 photos down to Florida. Then I thought: WAIT a minute. Step back. Just give them the photo! In fact, when it comes to all the hysteria surrounding holiday shopping and gift-giving, Zen emphasizes restraint, a stepping back, a balance. I like to think I'm managing that, more or less. But then again, there's still a little more than a week to panic. Apparently whoever painted this on the sidewalk was feeling quite negative about his or her personal relationships! Actually, I see this stencil a lot on sidewalks in lower Manhattan. 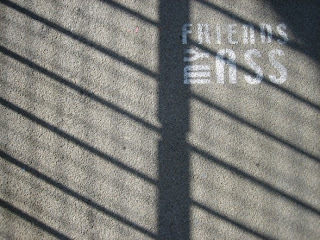 The cool shadows were caused by the suspension cables on the Williamsburg Bridge, which is one of three suspension bridges connecting Manhattan with Brooklyn. You can walk across the Williamsburg Bridge from the hip Lower East Side to equally hip Williamsburg, which is a fun, scenic jaunt on a nice day. You know those dim childhood memories living in the back of your brain, the ones that have gone dark and smoky and fuzzy around the edges? You almost never think of them, but occasionally they pop up entirely unbidden, and you say to yourself, ‘Why is my brain holding onto this?’ And then you wonder about the specifics? I couldn’t remember any of the details, like what year it was, or where the pageant took place, or who won. But I remembered swaying palm trees and lots of color and glamor. As I thought of this dim memory, I began to wonder: Could I find Miss Austria again? Could I figure out who she was, and, even better, what she’s doing now? Could I flesh out this hazy figure? Google is an amazing thing. Within moments, I’d found lists and lists of pageant winners. But most of those lists didn’t include runners-up, because, after all, being a runner-up is like being an unsuccessful nominee for an Academy Award. It’s briefly exciting, and then no one ever thinks of it again. I focused on the late ‘70s. I figured that had to be the right time period. But I recognized none of the winners’ names. I searched some more. Finally, I found this page, which was gracious enough to list runners-up. And there she was: Eva Maria Duringer, Miss Austria, first runner-up in the Miss Universe pageant of July 1977. That would have been about right. I would have been 10. More Googling. Lo and behold, Eva Maria Duringer also participated in numerous other pageants of her day, which I suppose is to be expected. There’s also now a philosophy lecturer at the University of York, in the UK, named Eva-Maria Duringer. Could that be her? Would beauty AND brains be too much to expect? I also found this page, which shows Eva Maria Duringer with the other top winners of Miss Universe 1977 _ held, by the way, in Santo Domingo, Dominican Republic. The page also shows her today. And then, most bizarrely, there are several clips from the pageant itself on YouTube - including the defining moment. She’s pretty. I’m not sure why she so captivated my 10-year-old homosexual imagination. But at least my memory’s not so hazy anymore. These streetlights were in a parking lot off Third Street. 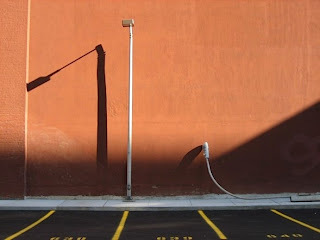 I loved the big spacious wall, and the contrasts between the light poles: One angular and vertical, one curved and horizontal. The shadows differ too, with some softer than others. I feel like I've been very blabby this week. Blah blah blah. I think this morning I will let you all enjoy some silence. When I began practicing Buddhism several years ago, I wrestled with whether or not to become a vegetarian. I've never been much of a meat eater, and for years in my early and mid-twenties I ate no meat, so it wouldn't have been difficult. But I also run and lift weights, and I feel like my body needs ample protein. At our Zen services we repeat a verse called the Four Vows, one of which is, "Sentient beings are numberless; I vow to save them." Eating sentient beings seems in stark conflict with this verse! So I talked about this with my Zen teacher, who pointed out that traditional Buddhist cultures in Asia are not strictly vegetarian, and in fact in places like Tibet there's not a whole lot to eat besides meat. There's always a tension between our desire to be compassionate and what our bodies require to live. For now, my rule is that I don't eat anything with legs, except chicken and, rarely, turkey. (I tried impala when I went to Botswana this summer - I didn't think I could pass up THAT chance!) And as with most rules, it's best not to be too emphatic - on the rare occasion that I go to someone's house and they've made a beef stew, I don't turn up my nose. I eat it. 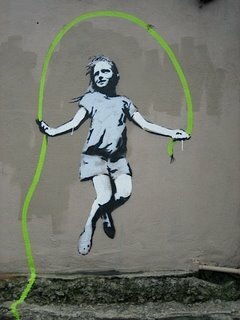 But it's still an uneasy balancing act. 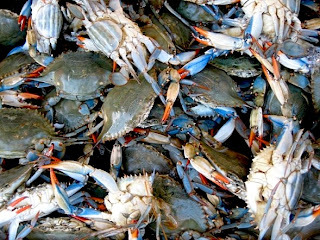 I try to eat meat minimally, and when I see critters like these crabs in Chinatown, I still have the impulse to buy them and set them free. Montauk is a small town at the eastern end of Long Island. Unlike the glitzy Hamptons, which are closer to the city, Montauk is still a pretty down-to-earth place. For example, when you walk around downtown you see t-shirt shops instead of designer boutiques, and bait shops instead of high-end home decor stores. There's a '50s glass-walled diner in the center of town called the Plaza Restaurant, where you can get a respectable but unassuming omelet breakfast for under $10. I took a day trip to Montauk last month, just for a change of scenery - it's three hours each way on the Long Island Railroad. Not that it hasn't been "discovered" - parts of the movie "Eternal Sunshine of the Spotless Mind" were filmed here, in the Plaza Restaurant and on the beach. And Andy Warhol is just one of the celebrities who had a house (actually a collection of houses) in Montauk, which recently sold for some obscene amount of money. 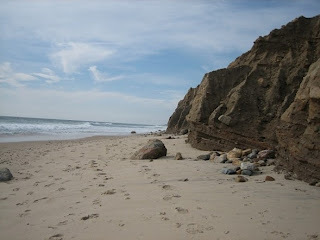 There's a really beautiful beach near Montauk town, and then as you walk eastward you begin to see cliffs like the ones above. East of town is Montauk Point, where there's a nice lighthouse. Beyond that, there's nothing but the windy Atlantic. 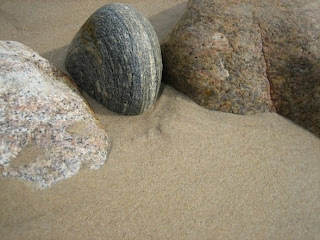 The beach is littered with smooth granite rocks. I am a sucker for smooth rocks. I always have an impulse to take them home. But I resist, because when you get back to civilization there's little more useless than a smooth rock, and they deserve to stay where they belong. 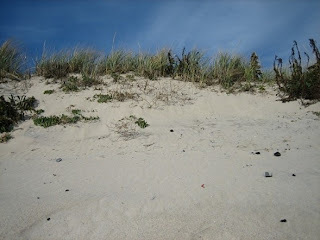 When I went, I set up a beach towel just below this dune, and lay in the sun for a rest. (I was fully clothed because it was, after all, November, so it's not like I was sunbathing. I dislike sunbathing, but that's another story.) Anyway, it was nice to lie there, with no sounds but the wind in the sea grass and the pounding of the surf. A worthwhile escape from New York City, and not bad for a $30 train ticket! 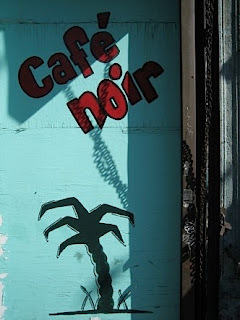 Cafe Noir is a restaurant on Grand Street in SoHo. I liked the idyllic palm tree paired with the industrial, brutal shadows of the chains for the security gate. Kind of an interesting juxtaposition. I have palm trees on the brain today because a) it's 37 degrees outside and b) I went to see an exhibit of Brazilian art at the Bronx Museum of the Arts yesterday. The exhibit is called "Tropicalia," after a cultural movement in Brazil in the late '60s and early '70s. It includes elements of music, graphic design, fashion, interactive sculpture and many other artworks. Most surreal is a big Brazil-themed installation featuring tropical plants, beach sand, raffia huts and live parrots! You can take your shoes off and walk through, so picture this: I'm carrying my winter coat, but I'm barefoot, slogging through sand like a castaway on Gilligan's Island. Very strange, but cool. Anyway, my favorite work was a contemporary psychedelic wall mural done by an artists' collective called "assume vivid astro focus" (a piece of the mural here). The fashions were pretty groovy too, lots of swirling color and interesting cuts. Very sixties. Last night, my friend Bill took me to see "Spring Awakening" on Broadway. It's an EXCELLENT show, with lyrics by Steven Sater and music by Duncan Sheik of "Barely Breathing" fame. (Remember that song?) These two have collaborated before - Sater also co-wrote Sheik's 2001 album "Phantom Moon," which I really like. Anyway, "Spring Awakening" is about adolescent struggles among German youths in the 1890s, but the themes are very contemporary and the cast is terrific. Go see it if you can. Really. 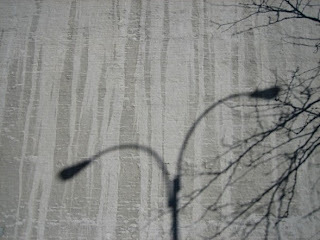 It always fascinates me how shadows wrap themselves around corners. Did you see the recent video of the octopus escaping from a glass box through a tiny hole? It basically compressed itself and slithered right out, which was kind of amazing to watch. (Here it is on YouTube.) 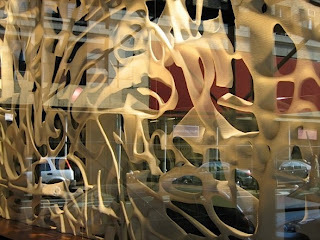 Anyway, that's what comes to mind when I think of these shadows, sinuous and flexible, slipping into every niche. Obviously not the same scientific principles at work, but oddly similar somehow - or maybe it's just me. The other night I wrote a post about my favorite record albums (if they can even be called that anymore). I thought I'd list my top 10 and tell a little about why I like them. I sifted through all my CDs and eventually wound up with a top 20, which was as far as I could distill my favorites. Then I wrote for an hour or two, explaining why each one was special. The next morning I read it and HATED it. First of all, the idea of a favorites list is pretty short-sighted, since favorites change with mood and circumstance. Second, I can't pretend to be an expert on what makes songs musically distinctive. It's all so subjective, and many of my judgments are deeply influenced by nostalgia. I think the whole premise is flawed. So I scrapped it. Suffice to say that singer-songwriters figure prominently in my musical tastes: Joni Mitchell, Joan Baez, Nick Drake, Carole King, Janis Ian, Carly Simon, Cat Stevens, Simon & Garfunkel. Stuff like that. I know. What an old fogey. 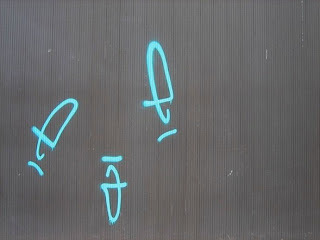 This peculiar graffiti tag showed up on the wall of a laundromat down the street a few weeks ago. I can't figure out what those little symbols are, but I've seen them elsewhere around town, and they always travel in packs, like UFOs. I like their random, scattered look. It occurred to me after I wrote yesterday's post that I might have left the impression that I enjoyed being a Boy Scout. In fact, nothing could be further from the truth. I liked being a very young Cub Scout and, later, a Webelo. But as I reached adolescence, the Boy Scouts became torture. Being a Boy Scout in rural Florida when you're growing up gay is sheer hell. You're like raw meat to a pack of hyenas - I got taunted and roughed up all the time by older scouts, and our redneck scoutmasters weren't inclined to stop it. ("Boys will be boys," they thought.) So I made a respectable exit from the organization as soon as my parents allowed it. We had some good moments, like a couple of fun campouts on the Withlacoochee River. I earned some awards for camping and swimming, and there were some boys my age who weren't complete animals. (They got roughed up, too.) But I was not a fighter, and was never going to be a fighter. In my book, the Boy Scouts encourage a kind of paramilitaristic conformity, and I was not going to fit that mold. 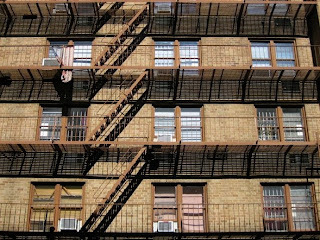 The orderly rhythm of these fire escapes, near E. 89th Street and Second Avenue, first caught my eye. 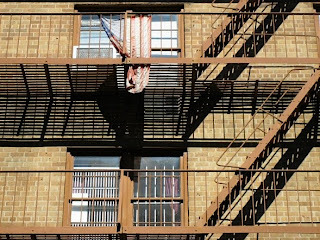 But as I took some photos, I paid more and more attention to the faded, tattered flag hanging from the railing at upper left. I'm sure this flag is a remnant from Sept. 11, 2001. Immediately after the terrorist attacks, lots of people put out flags. (Even I put a flag in my window, and I am one of the least likely flag-wavers you'll ever meet.) It was almost an instinctive reaction. For me, it was a way to express a sense of unity and support with all my neighbors. I didn't think of it as nationalistic or jingoistic, though it seems more that way now. Every now and then I still see one of those flags, tattered and dirty but nonetheless on display. Long ago, when I was an impressionable Boy Scout, I remember learning all about the proper disposal of old flags - they're supposed to be ceremonially burned when they deteriorate. (Ironic, given our government's attempts to ban flag-burning!) I guess these folks were never Boy Scouts - and where in New York City could you burn an old flag, anyway? Anyway, this is a very appropriate photo - a detail from a hand-painted advertisement for an exterminator. Well, everyone, I think I've made a terrible mistake. Last night, trying to be technologically forward-thinking, I switched to Blogger Beta. I did this because I'd heard that some people were having trouble posting comments to my blog with the old program, and I thought it would be nice to modernize. Unfortunately, Blogger Beta and I are not starting our relationship well. When I made the switch, many of the comments on older postings were suddenly rendered "anonymous" - so if you made a comment under a user name but now see it under "anonymous," that's why. To make matters worse, this morning I can't post pictures. 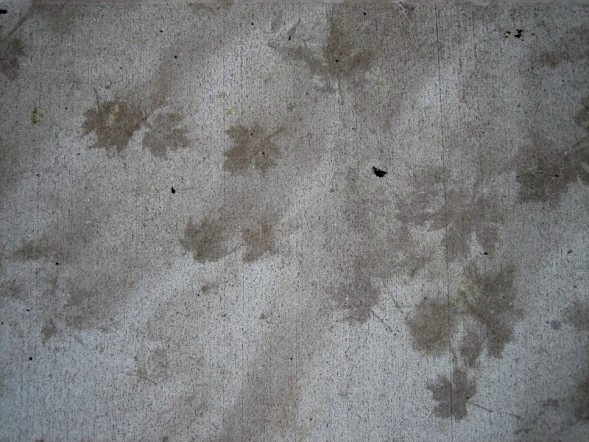 Fallen leaves sometimes create a ghostly stain on sidewalks. These were particularly nice stains - so detailed, yet beautifully smudged when the leaves were swept away. They seemed to represent this period of autumn moving into winter. We had a beautiful weekend after our cold front blew through on Friday night. 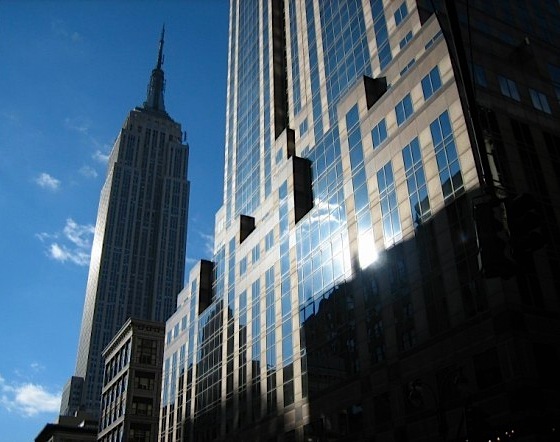 I took this on Saturday morning from the corner of 38th Street and Fifth Avenue, looking south. That's the Empire State Building four blocks away. As you can see, lots of sun and wild blue sky. The Empire State Building has never been my favorite, but it did play a crucial role in my decision to live where I do. 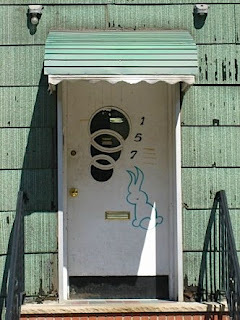 When I was apartment hunting in 2002, I looked at maybe two dozen places, and for various reasons couldn't find anything that worked for me. Then I was shown an unremarkable studio on E. 29th Street. I looked around the room, which was functional, and then out the window - and there was the Empire State Building, lit up like a colored beacon. Angels sang, and I made an offer instantly. I love being able to look out my window and see New York's most famous building! Despite the sunshine you see in this picture, photography was difficult this weekend. We're getting close to the winter solstice, so the sun now comes up around 7 a.m. and sets at 4:30, and even in midday it's just not very bright down at street level. 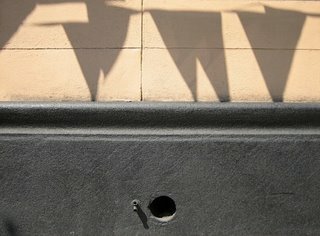 I wandered around Tribeca yesterday and I got some pictures, but everything was so shady - tough for a guy who likes shadows! Outside Bloom's Deli, someone put up two rows of those little triangular car-dealer flags. I like this photo of their shadows because it incorporates round, rectangular and triangular shapes. A good exercise for pre-schoolers, eh? I know everyone is curious about my adventures at speed-dating last night. (If you're not, you're excused...you may leave the room now.) I'll see if I can concisely explain what happened. About 55 guys showed up, and everyone was assigned a name tag with a unique number. We sat in two rows, with one row stationary and the other moving every three minutes. We'd have a three-minute conversation with some random guy, a signal would be given, and the moving row would stand up and shift down one position so we'd be talking to the NEXT random guy. At the end of an hour (and 20 "speed dates") we had a brief mingling period to meet anyone else in the room, and then we filled out little computer cards with the numbers of the people we'd like to go out with. Those cards were scanned for matches. It was weirdly exhausting. Each conversation was a little different, and there were some laughs, but I essentially found myself repeating the same information over and over: job, hometown, hobbies. After a while I got a little hoarse (the room was surprisingly loud) and the faces began to blur. By the mingling period, I wanted out of there! Good news, though: Of seven numbers on my card, three matched. So I exchanged phone numbers with Dave, Nathan and Robert, my future dates. I was walking on W. 91st Street to meet a friend one night when I passed a dark playground full of these little concrete horses. It was a bizarre sight, with the photos made even more bizarre by the ghostly flash. My AIA Guide to New York says the horses, created by sculptor Constantino Nivola, were installed to enliven otherwise bland public housing. 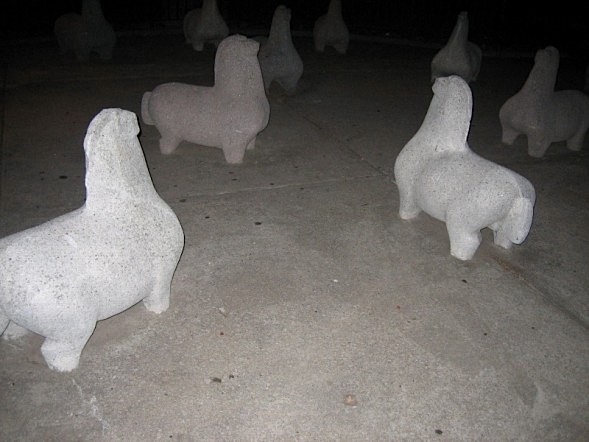 They've "seen some heavy use, but alas, there is no ASPCA to protect concrete horses," the book adds. We did get our cold snap yesterday. I sweltered all day in my stuffy office (where the air conditioner has been turned off because it's, well, DECEMBER) and then went to a movie with a friend. When we emerged around 10 p.m., a fresh wind was blowing and the temperature had dropped considerably. It's in the low 40s this morning. I'm trying to decide whether to send holiday cards this year. (I'm just barely of the generation that still feels obligated to do that!) In some ways I like them - they are a great way to touch base with friends and distant relatives. But I don't like all the paper and the waste, and they seem kind of silly when electronic communication is so much easier.